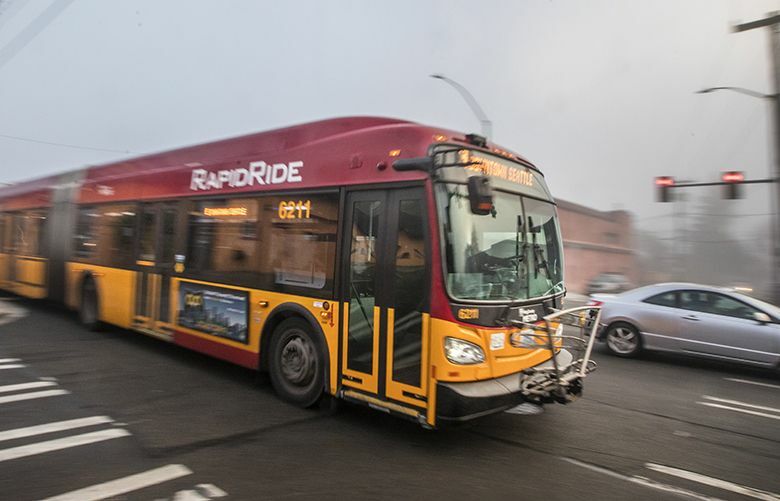 The e-commerce giant’s money will allow 22 more trips daily that can haul 1,700 people, King County Metro Transit says. Amazon will contribute $1.5 million to increase public transit capacity this fall, for Seattle routes where its workers squeeze into buses. The e-commerce giant’s money will allow 22 more trips daily that can haul 1,700 people, King County Metro Transit announced Wednesday. These affect some of the city’s most crowded corridors: the E Line on Aurora Avenue, the C Line from West Seattle, the 40, 62, and 63 from North Seattle neighborhoods, and the crosstown 8 to Capitol Hill and the Central Area. Amazon estimates more than 20 percent of its employees ride public transit, and fewer than half drive alone to its campuses between Lake Union and downtown. “We are excited to see the increased capacity, and will continue to work with Metro and the City of Seattle to find innovative solutions that provide long-term transit options for the region,” said a statement by John Schoettler, Amazon vice president of real estate and facilities. The donation represents a tiny piece of Metro’s fall service change, which adds 94,000 annual operating hours or a 2.4 percent capacity gain countywide. The Seattle area leads the nation in transit growth and taxation. More than three-quarters of a million daily riders are served by eight agencies — not counting private transit hired by companies including Amazon. Amazon will fund 12,000 hours, county taxpayers 62,000 hours, and Seattle an additional 20,000 hours using the city’s special $60 car-tab fee. Seattle once sought to buy 100,000 more hours, but Metro lacks maintenance bases and drivers to grow that fast. The company agreed to provide $1.9 million worth of service, which costs $160 per hour to operate, Metro spokesman Scott Gutierrez said. But when fare income is figured in, the net price to Amazon for two years is $1.5 million. “It could potentially turn into something longer term,” Gutierrez said. The company’s private Amazon Ride is limited to Eastside residents crossing the lake into Seattle, so investing in Metro’s service west of the lake benefits everyone including Amazon workers living in Seattle, a company spokesman said. Led by the world’s richest man, Jeff Bezos, the Seattle-based company has faced local criticism that it should pay more to offset its giant footprint in one of the nation’s most expensive cities. This spring the City Council enacted and quickly repealed a $275-per-employee head tax, sometimes nicknamed the “Amazon Tax,” earmarked to housing and services for homeless people, after facing a backlash that it would discourage jobs. Amazon employs 45,000 people in Seattle and paid $250 million in state and local taxes in Washington this past year, The Seattle Times reported. The company also contributed $110,000 to the Sound Transit 3 campaign to expand light rail, RapidRide bus service and Sounder trains. As for service on the street, frequency on the Aurora E Line will improve by a minute or two throughout the day using combined funds from Metro, Seattle and Amazon — so a bus shows up every four minutes in the peak hour. Microsoft and the cities of Seattle, Issaquah, Sammamish and Redmond, the University of Washington football program, and private and public schools have made full or partial Metro service purchases in recent years.